Crew: Torrey, Austin, Kade, Jayce, Garrett. Sponsors & Support: Trent Lilienthal, Saats Flooring, Vlcek Gardens, Carnivore Meats, JL Graphics. 2006 - I ran a 2-Person Cruiser with my best friend Jared. We ran seven races, with 6 Top 10's. We finished 11th in Points and finished 5th at the first Cool McCool 100. 2007 - Jared and I still had the Cruiser. We finished with 2 wins, 17 Top 10's and 13 Top 5's, and 4th in Points. 2008 - Ran the Cruiser for the first three races and then sold it and got a 4-Cylinder Hornet. Ran seven races with it. Finished with 5 Top 10's, and then took the rest of the season off to be with my family. 2009 - With the Hornet, finished the season with 1 A Feature win, 14 Top 10's, 6 Top 5's and 4th in Points at Mid-Nebraska Speedway. 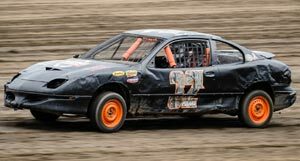 In the IMCA Sport Compact class at Butler County Motorplex, raced 11 times, finished with 2 heat race wins, 9 Top 10's, 6 Top 5's, and finished 11th in Points. Finished 7th out of 29 Sport Compacts at the 9-11 race at Butler County Motorplex. Finished 15th out of 39 cars at the Race Day Prints Sport Compact Nationals at Butler County Motorplex with my good friend John Sedlachek's Acura. 2010-2013 - Took time off. I started my career in a 2-Person Cruiser in 2006 at Mid Nebraska Speedway, finishing 11th in Points that year. 2007 saw us running the Cruiser again and finished 4th in Points with a couple wins. In 2008 we traded the Cruiser for a Hornet and ran it six times before taking the last half of the season off. 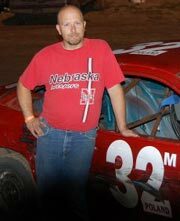 In 2009 I ran the whole season with the Hornet and ran two different tracks, Mid-Nebraska Speedway and Butler County Motorplex. I have taken the last four years off after having to deal with a lot of personal stuff, but am returning on a part time basis. I am coaching my daughter's softball team and my youngest sons soccer team so those will come first. When we have a free Friday or Saturday night we will pull to a track and give it our best shot. Going to be displaying some special colors on the car this year in memory of my father who passed away this January after a short battle with lung cancer. I am dedicating this year to him. RIP Doug Poland. To run up front every night no matter where I start, win heat races, A Features, and of course a Track Championship. If you're not out to win or have fun, then why are you even there??? When Jared and I had the Cruiser, one of our goals was to never go off the backstretch. Needless to say that goal didn't last long, as one night we got pushed off the backstretch and we got to see the nice "cornfield" back there. The next season we had Jesse running the gas and about four or five laps into the Feature, he nudged me and pointed to the floor and the throttle was stuck wide open!!! The smart thing to do would have been to pull in, but hey, we are there for the rush so we kept going!!! We controlled it for about another three laps. Then we swerved to avoid hitting Jimmy Cook who had spun in turn two and we looked like the General Lee flying off Turn 2. Needless to say, the scenery on the backstretch hadn't changed too much in one season. But it was still fun!!! And one of the coolest things (although it was scary at the same time) I have ever seen is when Torrey and I were running the Cruiser, the #21 had passed us on the high side, but got a little too high and was sideways over the berm on the top of the track. Well, they cranked the wheels a li'l too much and got airborne, and we saw they had painted the bottom of their car, and their drive shaft was bright orange! You see this stuff on TV all the time but until you see it in person and right in front of your eyes, you have no clue how cool and scary it is (glad them guys were ok too)!! !